Biological diversity is central to the health and success of any species or environment. Previous posts have incorporated the necessity of environmental preservation and conservation. 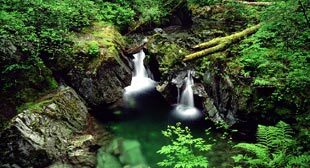 Vancouver Island is rich in natural resources, in particular, old growth forests. However, these forests continue to be exploited in spite of the availability of second growth forests. Old growth forests' true value is being ignored. rest Action Plan" for BC's coastal forests. Although there is a plan to shift away from logging old growth forests, there is no new restriction of logging old growth forests. Therefore, old growth forests are still unprotected and will be logged. The remaining stands, some reaching about 1,800 years old, are at risk of disappearing. Along with them, so will their genetic diversity disappear. ntific research". It is extremely important to acknowledge and the cultural and spiritual significance to First Nations people of various regions. We're living in a time of climate change and global warming. A Western Canada Wilderness Committee newsletter recently stated that old growth forests are far better at sequestering carbon dioxide from the atmosphere than the seedlings and second growth trees. It only makes sense to conserve the old growth forests for their role in carbon dioxide exchange. Preservation of old growth forests does not mean an end to logging. Second growth forests are at the stages that are ready for logging. This way the logging industry can continue and the sensitive ecology of old growth forests can be left relatively undisturbed. A report from the Pacific Northwest Research Department discusses ecological value of old growth forests. They indicate that "[t]he old growth forest's structural complexity is the key to its biological diversity. Complex habitats support a diversity of organisms that could not coexist in simpler environments". The delicate balance of mutualistic relationships such as mycorrhizae can flourish in old growth forests. Some research suggests that old growth forests are more valuable for lichen conservation than younger forests. In the same regard Natural Resources Canada states that "old growth forests provide an optimal habitat for species with specialization requirements, such as cavity-nesting birds, or symbiotic and parasitic organisms, or epiphytes (plants living on the surface of other plants)." This emphasizes the connectivity of species and environment within old growth forests. Dead trees, and uprooted fallen trees are just as important as living trees. Different stages of tree life create different niches for species to inhabit. Removing dead trees may reduce some species from being able to find a home. The Federation of Ontario Naturalists also state that machinery used to prepare cut over areas for planting and tree regeneration may destroy the natural microtopography of the area. If this is true, then logging machinery could also cause such destruction in the process of reaching a designated logging zone. When logging occurs, the trees are not the only thing being destroyed. As a result of habitat destruction, it is no wonder that city dwellers may have dear, bears, and cougars in their neighborhoods. If all this is not enough to halt logging of old growth forests, then what is? Now don't get me wrong, I know why governments implement plans of this nature. I am not naive. Yet, it is no less infuriating. It is a well known fact that when genetic diversity in a population is decreased, that population is at a heightened risk to disease, environmental catastrophe, and other debilitating events. When humans control and alter their environments in extreme fashions (which we often do) the results may vary from good to bad. Ultimately its up to the people to advocate for the protection of these beautiful environments. Previous posts here incorporated species' loss (Vancouver Island Marmot), and ecological preservation, as well as the human imprint left on the world today. This is all public knowledge. I hope that the interest in biological diversity and environmental sustainability does not end here. We need the diversity of old growth forests. This is not our land to own, we simply live here.